In April 2010 I bought a yamadori ponderosa pine (Pinus ponderosa) from Andy Smith of Golden Arrow Bonsai. 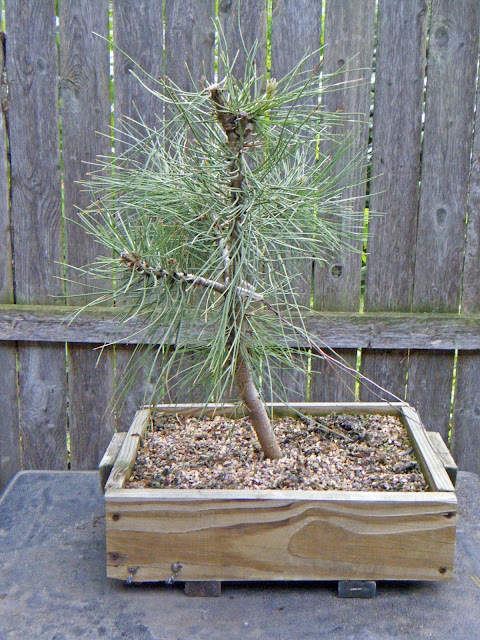 It also seemed like a good idea, a few months later, to buy a small nursery-grown ponderosa pine for a few dollars as a "learning tree." I had lost my first yamadori ponderosa through a series of mistakes of ignorance, and preferred, if possible, to make any further learning mistakes on a tree I could better afford to lose. To develop a shallow, compact rootpad on the "learning tree," I moved it into a homemade training box in the spring of 2011. Because Pinus ponderosa is native to a fairly dry climate, I decided to take a chance and use 1/8-inch-mesh hardware cloth for the entire floor of the box. (For any who don't know, "hardware cloth" is a galvanized steel mesh - think of it as window screen on steroids.) The purpose was to promote air-pruning: roots that grew downward and out through the mesh would dry out at the tips once in the open air, and the tips would die. The roots would seal off the dead tips, thereby blocking out pathogens and preventing moisture loss; and would branch further back along their length, within the soil mass. (25-1/2 cm by 30-1/2 cm by almost 9 cm). The lower trunk was about as thick as my thumb. April 29, 2012. I'm embarrassed to admit that I left the tree un-repotted for six years (to the day, by the way.) (Six years - fifty lashes with a wet noodle!) By this spring it was clearly high time to repot. I did the job this past weekend. The rootpad freed. 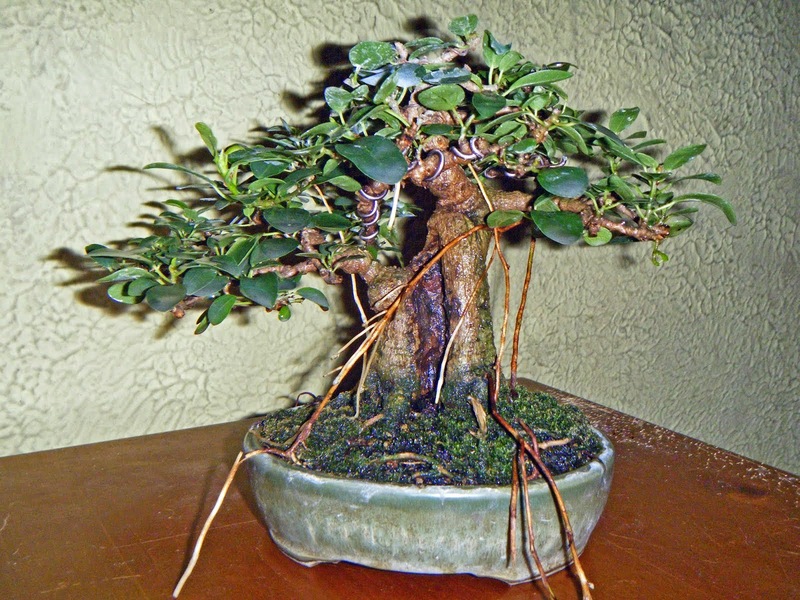 A nebari had begun to develop as well. You can see that the rootpad, besides being compact, is dense, with plenty of small roots ready to throw out more feeders. If the above-ground part of the tree hadn't needed more development, I could have moved this pine straight into a bonsai pot! I think I can safely say that the full mesh bottom in the training box proved its worth. I do want the upper part of this tree to grow a good deal more before I start serious training of the branches, so I moved it into a growing pot with more room for the roots. I know I'll lose some of the compactness of the root system, but I'll just have to re-develop that later. This picture is taken from about the same angle as the two immediately above.